Outstanding scientist- economist of new Kazakhstan, Economics, 2013. Kenzhegali Sagadiev is 75 years old. (Bibliography) Anniversary issue, Almaty, Basbakan, 2013. 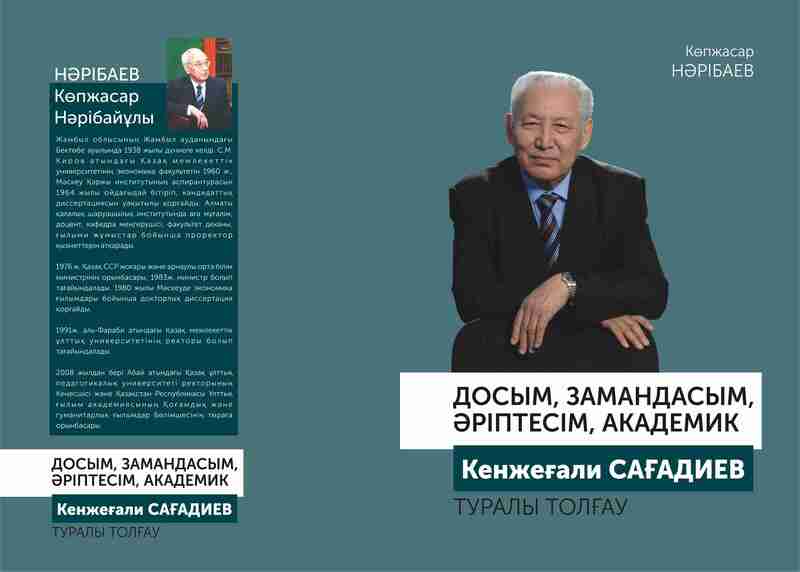 Remarkable life of Kenzhegali Sagadiev, Almaty, Al-Farabi Kazakh National University, a publication in the series “Life of Outstanding Persons”, 2012. Alma Ata Institute of National Economy – Kazakh Economic University, a short bibliography of veterans to the 50th anniversary of the University, Almaty, 2012. The eminent scientist and teacher, well-known organizer of higher school and science, public and state figure of the Republic of Kazakhstan will the age of 70th in February 18, 2008, Maman, 2008. The Central Office of the people’s democratic party “Nur Otan” congratulates the eminent scientist of Kazakhstan, Deputy of the Majilis of the Parliament of Kazakhstan, Kenzhegali Sagadiev with 70th anniversary. Egemen Kazakhstan, 2008. The scientist who is always in the row: portrait of a contemporary, Kazakhstanskaya pravda, 2008. Mentors and friends, Almaty Inju-Marzhan, 2008. Eminent scientist and politician will achieve 70 years, KazEU khabarshysy №1, 2008. The scientist- an eminent economist, KazEU khabarshysy No. 1, 2008. The Scientist – An eminent economist, Evero, 2008. Jubilee Dates, KazEU Khabarshysy №1, 2008. The Challenging Personality, KazEU Khabarshysy №1, 2008. From Rural Boy to Academician, Vechernyaya Astana, 2008. Academician K.A. Sagadiyev’s School, KazEU Khabarshysy №1, 2008. Meetings with the Teacher, KazEU Khabarshysy №1, 2008. He Lives as he Thinks, Nauka I obrazovanie v Kazakhstane, №2, 2008. The Friendship that is a Model to Be Followed, KazEU Khabarshysy №1, 2008. The colorful personality of the university system of Alma Ata Institute of National Economy -KazEU, Khabarshysy No. 1, 2008. The main dates and activities of KA. Sagadiyev’s life, 2008. Model of the best. KazEU, №1,2008. Best personality to follow. The Kazakh gazeti, No. 3, 2008. Pride of the people. Kostanay tany, 2008. Time of Kenzheken. Zhas Orken, 2008. Time of Kenzhegali. Astana khabary, 2008. Deep mindset of Kenzheken. The Zhas Kazakh Uni, No. 11, 2008. “Our Kenzheken” among academicians. K.A. Sagadiev turns 70 years old, Almaty Akshamy, 2008. Honor for the teacher, Vestnik of KazEU, № 1, 2008. A big teacher and caring leader, Vestnik KazEU, No. 1, 2008. Short autobiography of Sagadiyev, Vestnik KazEU, #1, 2008. At the height of intelligence. Vestnik KazEU, #1, 2008. To Step with thoughts, Persona, 2008. Presidents of the National Academy of Science, Science, Higher education institutions of the Republic of Kazakhstan, №14-15, 2008. Personality of high level. Dala International magazine, 2000. The respected people of Kazakh nation, 1st volume, «Dauіr», 2000. The story on the road or the conversation at the crossroads of century, “Torgai tynysy”, 1999. A Hot February in National Academy of Sciences of the Republic of Kazakhstan, Kenzhegali Sagadiev: a publication titled “Life of Remarkable People” 12th issue, 1999, 359 p.
Heritage of Nobles, Kenzhegali Sagadiev: a publication titled “Life of Outstanding Persons” 12th edition, 1999, 359 p.
The pure spring of Akkum. Akzhelken, №9-10, 1999. A remarkable life. Vechernij Almaty, 1998. Way of Scholar. Academician Kenzhegali Abenovich Sagandiev is 60 years old, “Arka azhary” newspaper, 1998. A fateful talent. «The Kazakh adebiety», 1998. Hallmark of Sagadiev, “Asia”, 1998. Justifying your birth in the world, Vecherniy Almaty, 1998. A friendly word about Kenzhegali Sagadiyev, “Kazakhstanskaya Pravda”, 1998. 60th anniversary of the academician of the National Academy of Sciences of the RK K. A. Sagadiyev, “Bulletin of the NAS of the Republic of Kazakhstan” No. 1, 1998. Academician K. Sagadiev and the first economic university of Kazakhstan, “Stolichnoye Obozrenie”, 1998. A key organizer of science and higher education, “Bulletin of the National Academy of Sciences of the Republic of Kazakhstan” No. 1, 1998. Science is an inherent part of the nation’s culture and indicator of a civilized society, “Akmolinskaya Pravda” No. 20, 1998. Сomprehensive scientific and organizational activity. Sagadiev Kenzhegali. A book series “An Outstanding Life”, 12th edition, 1998. Man of the era of changes. Sagadiev Kenzhegali. A series “An Outstanding Life”, 12 th edition, 1998. Intellectual- reformer in science and higher education. “Stolichnoe obozrenie”, 1998. Eyewitness, «Asia: Economika i Zhizn» №5, 1998. To the jubilee of science and higher education, “Fermer” No. 1, 1998. Academician Kenzhegali Sagadiev, “Akmola akikaty”, 1998 . The Natural Talent, “Zhas Alash”, 1998. Academician K.A. Sagadiev is 60, “Kazakhstan Zhogary Mektebi”, No. 1, 1998. Nobleman of Science. “Kostanay tany”, 1998. Bibliography of scientists of Kazakhstan. Ministry of Science- Academy of Sciences of the RK, 1997. Elite of Kazakhstan. Handbook, Institute of Development of Kazakhstan, 1997. The Distinguished Person. «Sukhbat», 1993 . Devoted to Science from A Young Age. “Turgai tynysy”, 1990 .